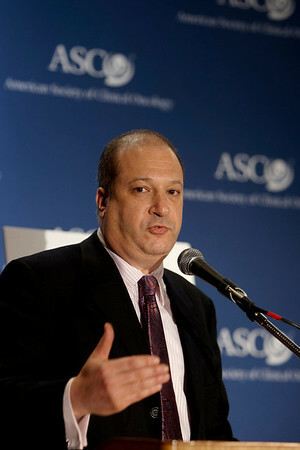 Chicago, IL - ASCO 2008: Mike Burg, CEO of Edge Entertainment speaks during the Frosted Pink with a Twist press briefing on Friday, May 30, 2008, during the American Society of Clinical Oncology's (ASCO) 44th Annual Meeting. The meeting attracts more than 25,000 oncologists, cancer researchers and cancer care professionals from more than 100 countries. Date: Friday May 30, 2008 Photo by © ASCO/Todd Buchanan 2008 ASCO Contact: Tiffany Reynolds/Communications Dept. ; 703-519-1423. Technical Questions: todd@toddbuchanan.com; Phone: 612-226-5154.